Can I just brag a bit, I am at Prima Art Adventure with my bestie Karen G and hoping to meet some other fellow bloggers at CHA this week too. What a blessing it is for me to do this! I made a tag with my new Spellbinders die and the luscious new Pion Papers "To My Valentine"
I colored Tilda in DI and added minimal Frontage. 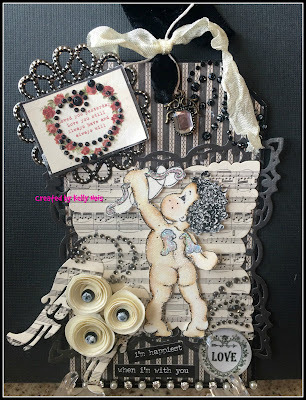 The Spellbinders die is the background and Magnolia doohickey die for the angel wings with some rolled flowers. I added some bling and chit chat stickers along the bottom. So niiiiiice tag ! Fab details ! Happy New Year Kelly!! A simply GORGEOUS tag...with that super cute cupid and gorgeous papers/embellishments! Have a wonderful day Kelly! Wonderful Tag Kelly, and hope you have a blast! Enjoy yourself! what a lovely way to start the year. Hugs. I think it might be both! Now if only I could get that lovely glistening look on my skin!! He's adorable - a little cheeky, a little naughty - but delightful. Love that musical background too. This is so cute, Kelly. I love this little Tilda. I always felt embarrassed to color her little naked bottom. LOL Darling creation.